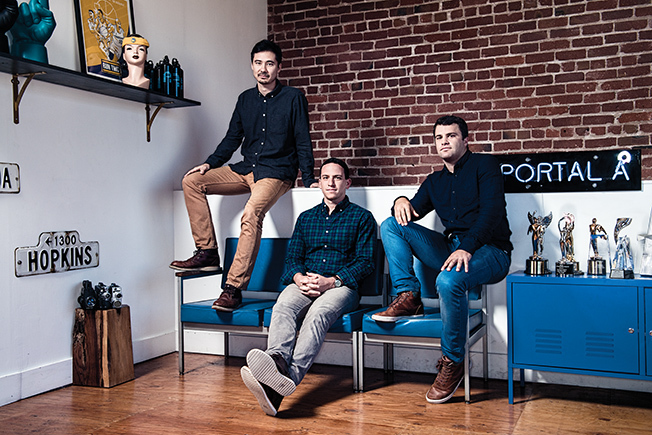 Portal A co-founders Nate Houghteling, Kai Hasson and Zach Blume met in first grade and made their first 30-episode digital series in 2005 during a trip to Asia. Five years later they reunited to develop "White Collar Brawlers," a series eventually adapted into a TV show on the Esquire Network. Finally, in 2010, came Portal A, named after the basketball court they played on as kids, founded with the purpose of creating branded and original content for a digital audience. "We consider ourselves a content company first. It's all entertainment built for the digital landscape," managing partner Blume explained. While the team has built an impressive client roster including Lenovo and Twitter, YouTube remains one of the studio's biggest accounts and a key part of its story. Since 2011 the team has made YouTube's hugely popular "Rewind" videos—last year's reached more than 100 million views—as well as the popular "SnoopaVision" April Fool's video starring Snoop Dogg promoting 360 videos for YouTube. This story first appeared in the September 12, 2016 issue of Adweek magazine.